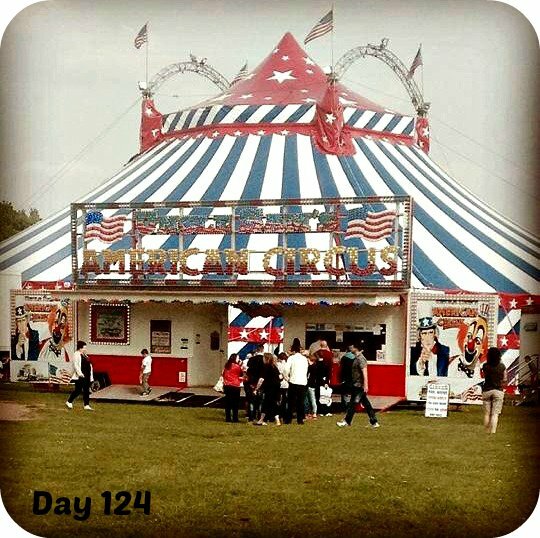 Day 124 – The American Circus was in town so we took the girls to see it. Munchkin enjoyed it…think Bee wanted to go join in as she wouldn’t sit still! Day 125 – Bank holiday, hubby was at work so we just spent some time in the garden, gardening and enjoying the sun……Bee decided to cling on to the swing frame….she’s not afraid of anything! 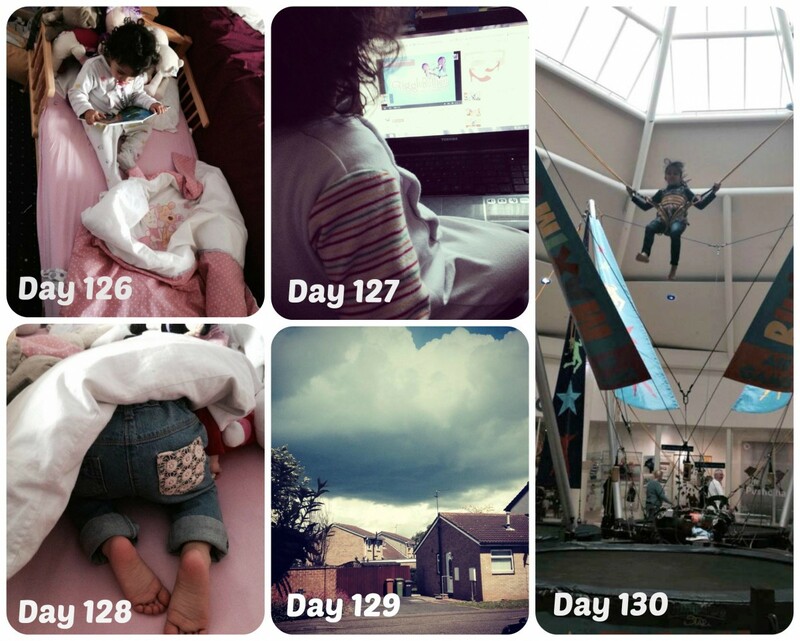 Day 126 – Decided to change Bee from her cot to the toddler bed as she was forever climbing out and banging her head. The transition was relatively painless and she is happy in her toddler bed. Day 128 – Just had to share this picture of Bee – She was actually asleep here…had to move the pillow off her head! Day 129 – Bit of a miserable day….spotted this huge cloud through the window just before the school run! WHY does it always wait to rain before the school run? Day 130 – Went to get my eyes tested and some new glasses. Bee has broken mine so currently sporting the sellotape look…I wasn’t due to get any new ones until November….so unexpected expense….BUT on the plus side got some nice designer glasses for free along with the main ones which I have asked to be made into sunglasses! 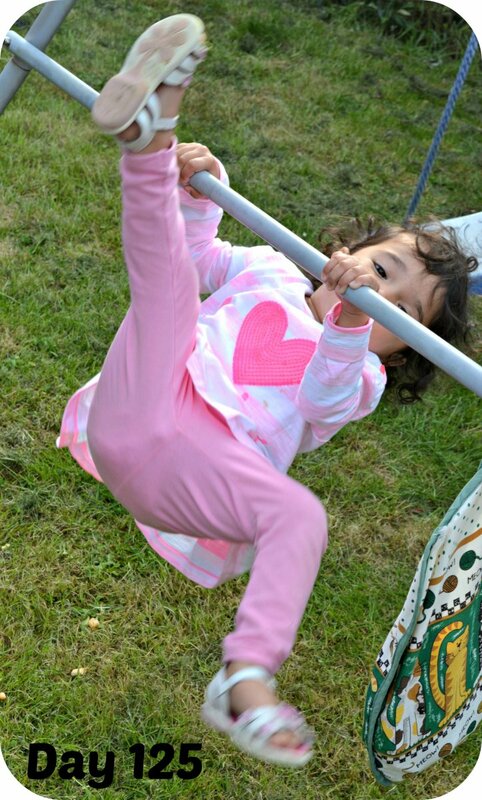 Munchkin had to have a go on the trampoline thing outside….Bee was a bit upset that she couldn’t have a go! Love that circus tent photo! I’ve not been in years! I bet my two would love the circus, though like your youngest, I’m not sure mine would sit still! I wish they’d had those trampoline bungee things when I was a kid. They look so much fun. Love the sleeping pose. Children do sleep in funny positions sometimes. Im sure Bee would have loved the trampoline bungee. Circuses are so much better now they dont have animals in. Oh dear at the glasses needing replaced.